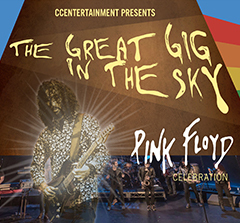 For the first time ever, CCEntertainment will bring their hugely popular, 17th annual, 'The Great Gig In The Sky' celebration of Pink Floyd to the Bathurst Memorial Entertainment Centre on Saturday 19th October 2019. This brilliant homage concert features numerous gems from The Wall, Wish You Were Here and Dark Side Of The Moon showcased by exceptional guest vocalists Hugh Wilson (Lenny Kravitz Band), Frank Lakoudis (Bad Moon Born / The Voice), Spencer Jones (The Voice) and introducing Taya Chani. Led by creative director Joseph Calderazzo (Jenny Morris Band) the superb eight-piece band including Ian Tilley (Boom Crash Opera), Paul Najar (Wa wa nee) Bennet Livingston (Lillye) and Claudine Field. With a reputation for breathtaking moments and stunning interpretations, this show has sold out in Sydney venues since 2003 and is simply unmissable. The Great Gig in the Sky Pink Floyd Celebration will go on sale tomorrow Tuesday 19 March at 10am. Special Early Bird Adult tickets price of $54 for 48 hours only.